Cf. Aristotle’s Historia Animalium 487a: Καλῶ δ’ ἔντομα ὅσα ἔχει κατὰ τὸ σῶμα ἐντομάς, ἢ ἐν τοῖς ὑπτίοις ἢ ἐν τούτοις τε καὶ τοῖς πρανέσιν. 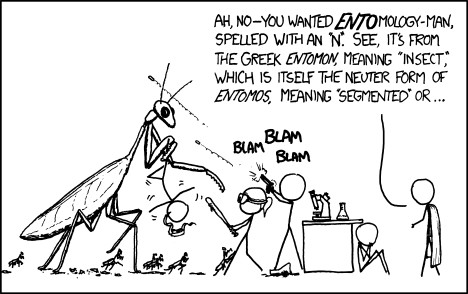 “I call them ἔντομα (lit. neut.pl. ἐντομος things-cut-in-pieces) as so they have segments (ἐντομή) for the body, either on the belly or there and on their backs also.” ἔντομος ‘cut in a pieces’ can be further broken down into the preposition ἐν plus the root *temh₁- and the Caland adjective suffix *-mo- . The same is found in Greek τέμενος ‘sacred precinct ‘ < *témh₁-no- which originally meant a patch of land ‘cut-off’ and dedicated to a god. Although, the same word te-me-no also occurs in the Linear B tablets and doesn’t necessarily have to be the area cut off for a god, but can be, for instance wa-na-ka-te-ro te-me-no (PY Er 312) /wanakteron temenos/ ‘the official domain of the king’. The same root in a different Caland formation, but with similar semantics to τέμενος in Classical Greek gives us Latin templum (< *temh₁-lo-) which was borrowed into English as temple. You see what just happened there, was that I just started going after the reference in Aristotle, and I was going to leave it at that, but then I felt the need to etymologize ἔντομος in terms of its Indo-European root, and from there I felt it was absolutely necessary then to bring in the alternative semantics from Mycenaean Greek, and the English-Latin parallels, and I realized it all kind of got out of hand. Etymology-Man would be proud. 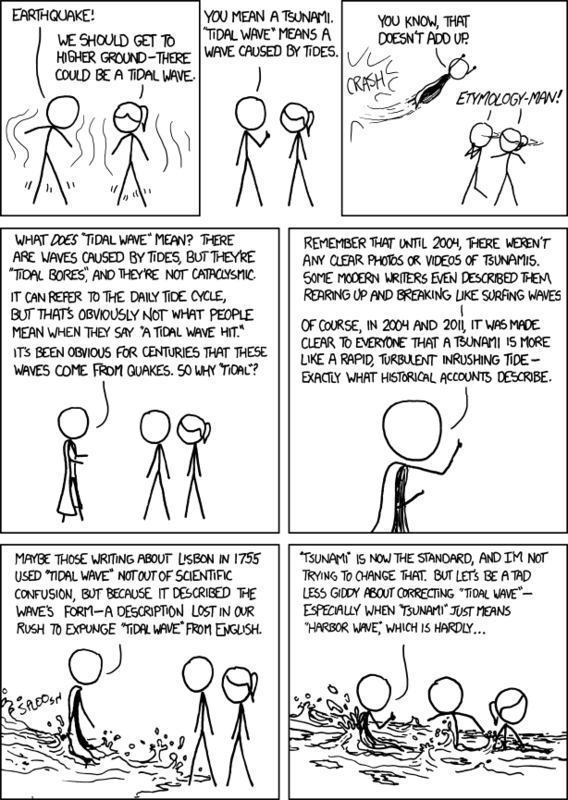 Tags: etymology, etymology man, philology, xkcd. Bookmark the permalink. Am I right in thinking that Greek demos and indeed English “time” are also derive from *temh1? how does one actually pronounce h1? Pronunciation of the 'laryngeals' is really a matter of opinion. All we know is that they were there and had various phonetic effects, on the basis of which people have conjectured all kinds of things. Normally, because of the neutral-colouring effect of *h₁ on adjacent vowels, most specialists would tend to think that it was probably something like either a velar fricative [x], a glottal fricative [h], or a glottal stop [ʔ]. Re: “how does one actually pronounce *h1?”: One doesn’t. One will probably choke to death if one tries.